Through a process called "Wavefront Sensing and Control," or WFSC, software aboard the James Webb Space Telescope will compute the best position for each of 18 mirrors and one secondary mirror, and then adjust the positions. Engineers used a 1/6 scale model to test the WFSC software. 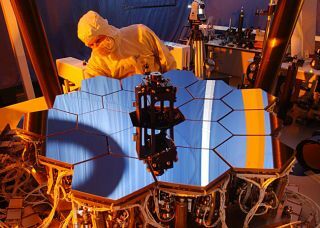 Engineershave successfully tested the mirror-controlling "brain" of the JamesWebb Space Telescope (JWST), which is expected to rival imagery taken by theHubble Space Telescope. Thesoftware, known as Wavefront Sensing and Control (WFSC), will allow theWebb telescope to adjust its 18 hexagonal mirrors. "It'scritical that all 18 mirror segments be aligned in position so that they act asone smooth surface," said Bill Hayden, a systems engineer at NASA'sGoddard Space Flight Center (GSFC) in Greenbelt, Md. "This will allowscientists to clearly focus on very dim objects that we can't see now." JWST isslated for launch in 2013. With acombined mirror surface of 269 square feet (25 square meters), the Webbtelescope will have nearly six times the light-gathering ability of HubbleTelescope, which has one giant 46-square-foot (4.3-square-meter) mirror.Astronomers expect such sensitivity to allow them to see the first stars andgalaxies of the universe as well as young planetary systems. The Webbtelescope will launch in a folded-up configuration, later unfurling itslightweight beryllium mirrors in orbit one million miles (1.6 millionkilometers) from Earth. Unadjusted, however, the Webb telescope's mirrors wouldproduce blurry images like Hubble did when it first peered into the cosmos. David L.Taylor, president and chief executive officer of Ball Aerospace &Technologies Corp., said WFSC software that will prevent the problem is basedon the same code used to fix the Hubbletelescope's imperfections. "Thismajor technological accomplishment, which built on the legacy of software algorithmsused to fix the Hubble Space Telescope and align the Keck telescope," saidJohn Mather, the Webb telescope's senior project scientist at GSFC. To test theWFSC software, engineers created a one-sixth scale model of the Webb telescopemodel in the laboratory. Once in space, the real 6.2-ton (13,700-pound)telescope will snap a picture of the cosmos, run the software correlating the18 different light sources (its mirrors) and then correct them using tinymotors. In thequarterly newsletter issued by the Webb telescope's scientists, Hayden said thetesting isn't fully complete, but should go forward without a hitch. "Thetests started in mid-October and will finish by early December," Haydensaid, adding that recent results suggest final testing "will be verysuccessful." Webbtelescope scientists presented their mirror-adjusting work on Aug. 26 at theSociety for Photo-Optical Instrumentation Engineers meeting in San Diego, Calif.